As part of Computer Science Education Week, our students participated in the Hour of Code worldwide event. Hour of Code is an international grassroots movement designed to introduce students to basic coding. 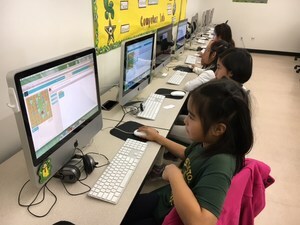 As part of Computer Science Education Week, our students participated in the Hour of Code worldwide event. Hour of Code is an international grassroots movement designed to introduce students to basic coding. During the weeks of December 11th and December 18th, each student spent one-hour coding on iPads, Chromebooks, or in the computer lab. We utilized several programs including allcancode.com, code.org, and Kodable.com, and kept track of how many lines of code each student completed. At the completion of the two weeks the scores were tabulated for each classroom. Ms. Morioka-Shimazu’s first grade class wrote the most lines of code for lower grade and Mrs. Feng’s 4th grade class wrote the most lines for upper grade. These two classes won a programmable robot for their classrooms! The students from each grade level that wrote the most lines of code also received certificates presented by Mr. Perry. Our students did an excellent job using their critical thinking and problem solving skills to code!